Regal Introduces Four, Six and Eight Port Filtered and Un-Filtered Right Angle BNC Connectors | Regal Electronics, Inc.
Sunnyvale, CA — Regal Electronics has added four, six and eight port right-angle BNC connectors to its product line. 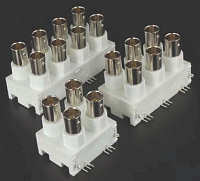 The multi-port BNC connectors represent potential manufacturing cost savings as a replacement for applications where a number of single or dual port BNC connectors are currently being used. Typical applications that could benefit would include video switcher and distribution banks, communications and recording studio equipment, matrix switchers, medical devices, and video surveillance systems. The RoHS compliant multiport BNC connectors are available in both filtered and un-filtered versions and 50 or 75 Ohm impedances. The specified operating frequency range is 0 to 1 Ghz., tested and usable through 2.0 Ghz. The connectors are of the classic through hole/PC mount configuration, and have sturdy solderable mounting tabs for strength and connectivity. Since 1976, Regal has manufactured quality electronic components, speakers, connectors, and a wide variety of related products and services from its operations in the United States, China and Taiwan. Engineering support for Regal Electronics, Inc. line of products is located at its Sunnyvale, California, headquarters.